I used to blog a lot about photography techniques before starting Shutter Tours and thought I’d pull this one out from a post I made earlier this year. This is one of my favorite methods to create art like the image from a landscape photograph. When you take our tour, we look for some great textures to add to your arsenal of images to create some fantastic art. I have been driving around my MacBook Pro with my new version of Photoshop, trying to learn all the little nuances hidden under the hood. Somehow I got sidetracked and ended up at istockphoto.com looking at textures. Don’t ask me how, it just happens when one has a period of boredom, followed by flashes of inspiration and then some temporary forms of ADHD. Anyway, so I searched for textures as I wanted to work with some layers in Photoshop and play around with some images I shot over the weekend in Seattle. Not having any textures at the ready, I found a texture of a Tuscan wall that I figured would work perfectly. Yes, I had to pay for it, but I wanted it now and did not have my Europe images close by and the time to spend hours hunting for a texture. Besides I I started looking at my old Europe CD’s, I’d end up on some other tangent and never accomplished goal, so I bought it. Initially I was going to use an image of Post Alley by the Pike Place Market but felt that the Seattle image would work a lot better. In the upper left corner, you can see the original texture file as well as the Seattle photo I used. So, let’s see step by step how I created this. First, I opened the main file, and since it is one I sell for stock, it was already perfectly edited. I then created an empty layer and brought the texture image into this new layer. 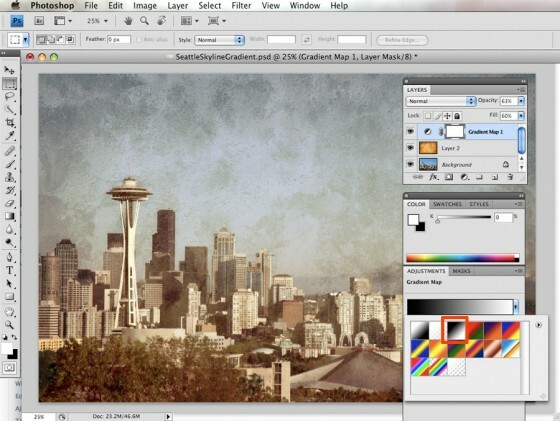 Make sure you create a new layer and do not do a layer from background. Now here is where the fun comes in. 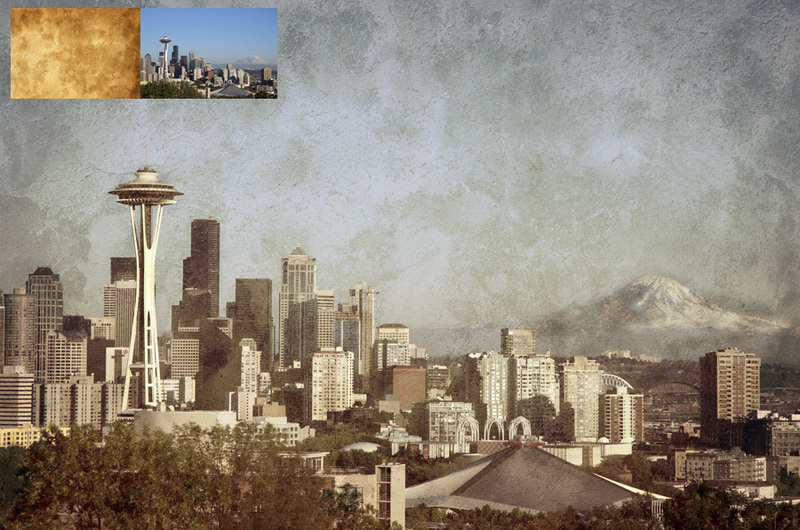 Since the new layer will be blocking out the background image of the city, we need to adjust the opacity. As you can see in the above image, we click on layer 2, as highlighted in blue. You’ll notice a few dialogue box options we can choose. First, there is the opacity option, which allows us to bring the background image back as we adjust it towards zero. In this case, I set it to 86. Being that the Layer 2 image is a brown tone, it also tone’s the overall image which I was looking for. I then adjusted the fill to 55%. Fill is a different adjustment than opacity, as I understand it and someone corrects me if I am wrong, it reduces only specific pixels, whereas opacity adjusts the whole layer. Next and this is probably the most important thing to do, I started playing with light on layer 2. This is where you can get some cool effects, but the one I chose was Hard Light. This gave me the perfect combination that I was looking for to create an image that looked both like an old photograph and had the potential, to maybe even look like a painting. I then created another new layer and this time I used a gradient fill as you can see in the above example. The fill I chose was the third one over, (Red Box). This is another area you can experiment with. Different fills will give it different colors. On this layer I left light to be normal, fill at 60% and opacity to 63%. I then went to the original background copy and brought out some of the whites on the Mt. Rainier and the Space Needle. And that’s it! This is an easy way to change images that may have been throwaways or bad lighting. When you are out shooting or just riding the bus to work if you have a good point and shoot start taking photos of textures on walls, floors, even old books, and magazines. Build up your portfolio of textures and then start playing in Photoshop. The great thing is you can also save your PSD file as a template and just replace the background image with another, and all your layer settings will allow you to change other images fast and easy. For more inspiration, check out Nitsa’s nonphotography blog, she’s the queen of this technique. 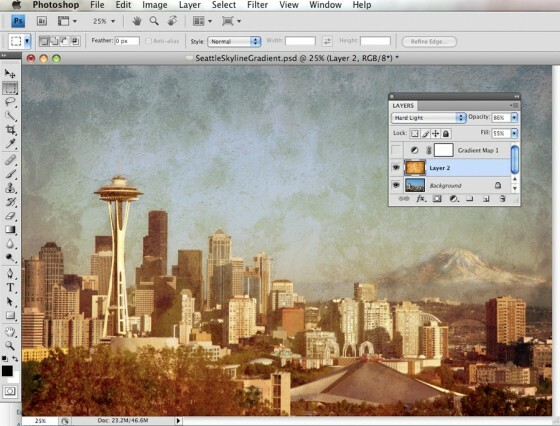 This entry was posted in Announcements and tagged adobe, cs4, kerry park, photoshop, PS, Seattle, skyline, textures. Bookmark the permalink.